Some of this may surprise you, but please bear with me! 1. DON’T get yourself into a position fiscally where you have time to spend writing every day. job teaching English. Hmmm…. what to write about? desperate to read another of ‘Those Funny Andalucians/Provencales/Vietnamese’ sub-standard memoirs about unhelpful locals and tongue-tied retirees from Blackpool and Bognor. Okay, don’t forget you might have time to write, but will you be able to write anything people want to read? My advice: don’t give up the day job. 2. DON’T live somewhere exotic/inspiring. We’ve all read Chris Stewart’s Driving Over Lemons. How hard can it be? No-one tells you that hiding away in darkest Andalucia means you’re not so available when it comes to sending manuscripts or maintaining a broad-(in the least broad sense of the word) band connection to send your submissions to the agents and publishers who actually accept an e-submission. Ah… manuscripts. We British are always inclined to complain about the Royal Mail. I’ll never do it again. It’s not the deliveries that are so random, rather the collections… from main Branch Offices. My advice: stay where your market is – unless you’re moving to Berlin or Barcelona. Yes. Why not? Type up your word document, convert it to PDF and upload it to Bubok/Lulu/the on-line POD publisher of your choice. You don’t need it proof-read, do you? Well, no. If you’re one of those rare creatures with superb spelling, superlative syntax and great grammar. Even if you have, your precious book will emerge as a horrible hodgepodge of misplaced indents, crazed paragraphing and inexplicably blank pages – if you don’t get someone to look at formatting your document so that it can be typeset properly. My advice: pay someone to do both, even if you’re self publishing. Well, up to a point. A look around the charity shops and second-hand markets of Southern Spain shows that in recent times there are fewer and fewer stalls dedicated to books. The worst phenomena that occur in UK publishing: Ghosted Celebrity Autobiography, 50 Kinds of Dire, Pastel-covered Chick Lit, all appear in microcosm on the few stalls that have books for sale alongside that broken toaster and a pre-flat-screen era TV. Some of these books look brand new. They may not even have been to the beach. DO a local pub-quiz and count the full marks awarded in the Literature round, if there is one. On the Costas themselves, count the red-tops on display next the stuffed donkeys and cheap flip flops. Your magical realist fable is going to be difficult to crowd fund here. My advice: Start a book club and a Creative Writing group. The same people may be in both, but nothing ventured. 5. DO get properly connected. Yes, I know you’ve got a computer. If you are not a social networking whiz, find someone who is. Join something like Ether Books or Jottify and get tweeting/Facebooking: become an e-mail pest and start annoying people into liking/reviewing/even buying your short-stories. These sites are about networking, the more people you can interest in what you’ve written the better. My advice: Spend treble the time (at least) on marketing as on writing. It’s no good writing a ground-breaking novel if no-one reads it. You can be Jack Kerouac (15 years to get On the Road published) or E L James. You decide. I haven’t done anything right. I am in the process of taking my own advice. We’ll see if it helps. 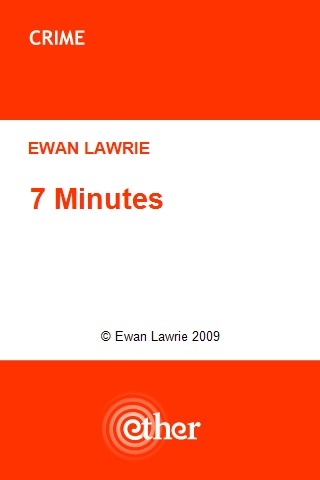 Ewan Lawrie lives in inland Southern Spain. He teaches English to a selection of bemused Hispano-phones and writes in his spare time. He has pieces published in various anthologies which actually have ISBNs! He has a novel which has been on the cusp of being ‘taken on’ for so long now he has written three quarters of a sequel. He is a member of too many writing sites and has won an occasional prize or two, when he can find something that has not already appeared on line to submit. 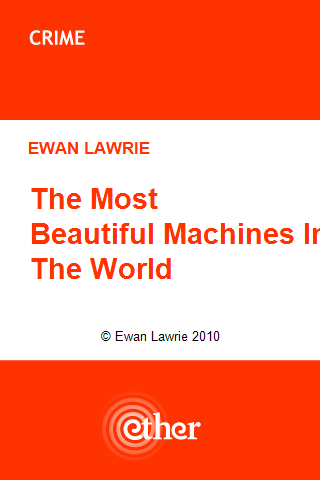 You can try Ewan’s attempt at self-publishing complete with eye-watering typesetting. His unit-selling collection of short-stories ‘Please Allow Me’ can be found on Jottify. 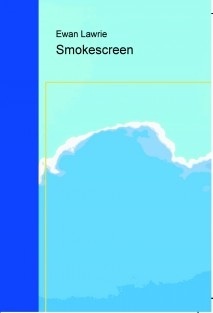 He has several short-stories on Ether Books, if you are rich enough to have an I-Pad or I-Phone, some are free. 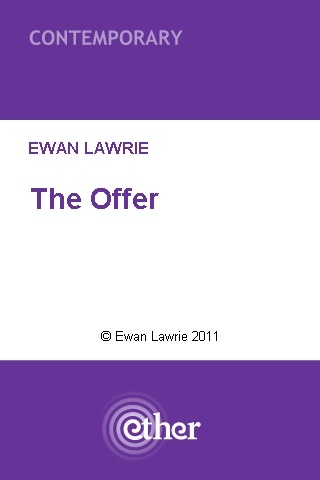 Hunt in the drop-down menu of writers for Ewan Lawrie. Well, now I’ve got your attention, this is my story. I have been writing since I first picked up a pen. I don’t have blood in my veins, I have ink! But it has to be black, I can’t write in blue. I was encouraged in my reading and writing by my Dad and Paternal Grandad. Mum was only ever really interested in her animals, and seemed to see reading and writing as a complete waste of time! In later years, a rather strange ‘coincidence’ made her change her mind! Since then, I have had a variety of poems and short articles printed in various papers, anthologies, and magazines. Some were paid but not many. The very first one I saw in print was in our local paper, when I was about 11 or 12 years old. My poem was a long one about the Vietnam War, the paper did a 2 page spread on the war, and put my poem on the same page. I still have the very ragged cutting! The moment I saw that, something deep within me started restlessly moving. 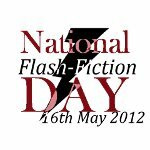 One day I was going to be a published author with a hardback novel to my name, I just knew it. Poetry is good for the soul and I used it mainly for its cathartic nature. Every time I received a rejection letter for another short story, or even for a novel, I resorted to poetry. They say ‘write about what you know’ don’t they? Well, for years I totally ignored that, and wrote what I thought would sell. If only I’d written about what I knew, I might have been published much earlier. I went to College as a ‘mature student,’ and achieved A levels in, Arts and Crafts, Art History, and Photography. They led to an Honours Degree in Cultural Studies, level 2 Counselling Certificate and a teaching Certificate. Then, I decided I enjoyed the whole College scene and, with a little nudging from various people, especially husband Chris, I went on to achieve my Masters in Writing Studies (a combination of Eng. Lit and Creative Writing). I loved it. And again, one of the things I learned was, ‘write about what you know’. But still I wrote what I wanted to and sent out poems, articles, stories, and even novels, all of which came right back to me. I started calling them ‘frisbees’ as, every time I received one, I’d spin it across the room in disgust! I then started teaching Arts and Crafts and Life Skills, to people with special learning needs, and Creative Writing, in both evening classes, and Open College classes, for the local FE College. I also led workshops for the local library on a regular basis for a while. I was in my element! I still love gabbing on about the wonder of writing, to anyone who will stand still long enough to listen! As a child, we had lived on farms (where I ran wild in the fields, riding the beautiful Jersey cows, and herding geese) and in pet shops (with fierce ferrets, grumpy gerbils, savage skinks, and pesky piranhas) and in poodle parlours. So, chances were very strong, that I would be an animal person when I ‘grew up’ — and I am. After Chris and I married (we met in a field, of course!) we moved to Kent, where we renovated an old farm cottage, long before ‘doing up’ was fashionable, turning the land around us into a smallholding with animals and poultry, as well as crops, I also used the tons of wild, free food that surrounded us. As well as the two Westerns (published this year by Robert Hale), I am now working on my autobiography, stuffed full to bursting with stories of my animals and of our lives on our tiny smallholding, where I had the chance to keep ponies of my own, at last. It will probably run into 3 books, as there are so many stories, some of which are funny, some tragic, but almost always concerning animals. I know a fair bit about horses. I had been riding since I was 3 and have spent all my spare time with horses, for around the last 20 years. I know a fair bit about Native Americans and have had a passion for their culture since I was young. For me, even as a pre-teen, I felt they knew how to live with the Earth, and make use of all the free resources which surrounded them. They knew how to be at one with Nature. I wanted to be an Indian. I grew up watching lots of cowboy series, and movies, Laramie, Bonanza, Stagecoach, Lone Ranger, Champion the Wonder Horse, and so on — you get the picture. So, cowboys, Indians, horses, where do you think this is going? And then… stay with me, it really does have some bearing on the whole picture, honestly! My husband Chris had grown up with no knowledge of his real father; his mother married when he was 7 and never told him about the man who had sired him. He had often mentioned to me that he wished he knew who his real father was, and where he was from. His mother had died without revealing her secret, but left some old sepia photographs of men in uniform in the back of a drawer. No-one in the family knew who they were but, for some obscure reason, they were collected by Chris’s sister and put in a box, along with their Mum’s other papers. How grateful we are that she didn’t just throw them away. Knowing how much it meant to him, for his 65th birthday I bought Chris a DNA test, to try and settle it once and for all, thinking this might be the last chance we would have, as his father would then be quite old, or even deceased. The results were posted on the Ancestry web site. A mere couple of weeks later, another result came up on the site, which bore a remarkable similarity to Chris’s. 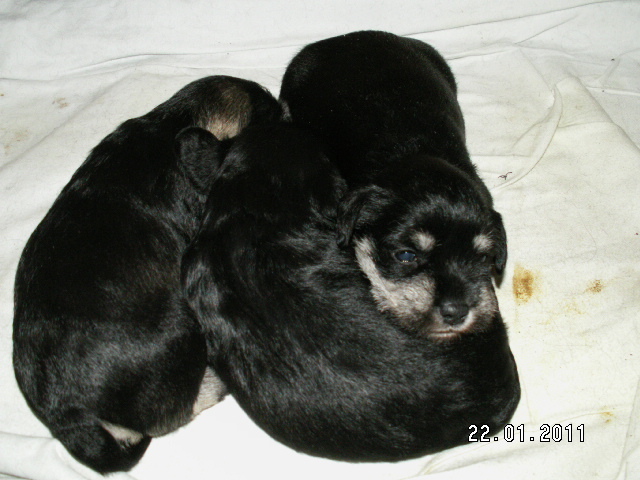 We sent e-mails back and forth, and then I thought I would ask if we could send the old photos, on the off-chance someone might recognise them. The photos were e-mailed to California and, the next day, the reply came, beginning with the words, ‘We have a Match’! One of the men had been recognised by two family members separately. He was their uncle! So Chris and Stuart are cousins. Unfortunately, his father had died some years previously, so Chris never did get to meet or talk to him, but we are in constant touch with the ‘new’ relatives. Thank goodness his sister had kept those photos. 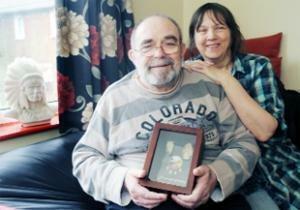 Now he keeps a picture of his real father, and grandparents, beside his bed. He wanted to take the name of his real father, so we added it to the name which he grew up with, and now we are double barrelled! Cousin Stuart and his partner came to England from California last year, and visited with us for two days. For Chris to be able to shake hands with his real, blood family at last was quite an emotional moment. But for me at least, the very best part of the story is, they are the Great Great Grandsons of a Chippewa chief. Their ancestral home is in Wisconsin, a densely forested area, right at the edge of the Great Lakes. So, from being crazy about Indians for so long, I am now actually married to one! Now Chris will be an Elder of the tribe, and has been bestowed with a Native name ‘Waa-Bani-Noo-Din’, which means ‘The Wind That comes from the East’, as our voices are sent to them over the airwaves from the East of them. As his wife, I have also been bestowed with a Chippewa name – ‘Nii-Gaan-O-Se-Kwe’, meaning ‘Woman Who Leads’. I love it, and am so proud to have it. Then, in 2010, our lives changed quite drastically. In June I had a heart attack. I was in hospital for a week, and told to take it easy for a year after I got home. Then, in the August, just to prove he could do better than me, Chris had a stroke. He was in hospital for a month and now has to use a wheelchair, cannot use his right hand (and he’s right handed) and has difficulty communicating. He had another, smaller stroke in October last year, which affected his swallowing. So I never did get my restful year and am left with angina and arthritis. I hide from the world in my writing. With that, it doesn’t matter what goes on around me, I am in another place and, when I can have a good day on my writing with no interruptions, I have a sense of a job well done. My writing then took a very strange and different turn and I began at long last to write what I actually knew about; horses and Indians, and cowboys. A little while after all the DNA story had been sorted, I had a dream, possibly started by Chris’s family story, or there might be another, spookier reason – read on. 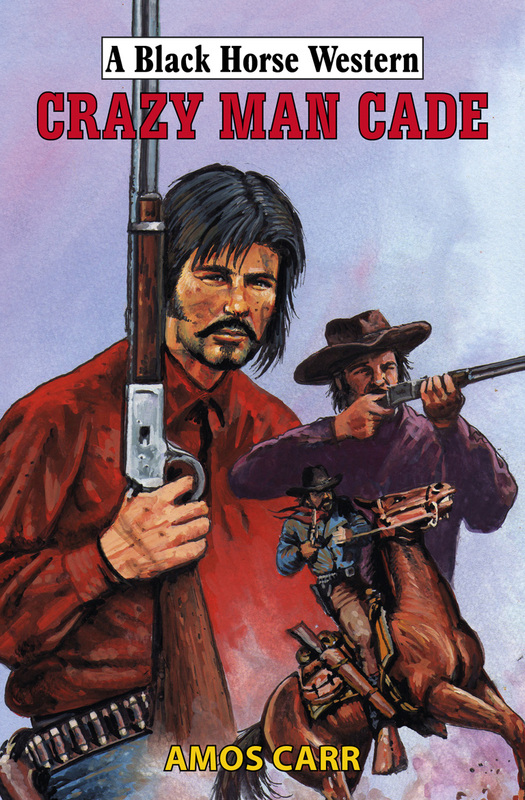 The dream gave me a title and almost the whole plot for a Western novel. I had never even thought of writing in that particular genre, which, given my childhood interests, is probably a bit strange. I wrote the book, which took me about 6 months. I did have to do some research, but most of it was deeply embedded in my brain from my childhood. 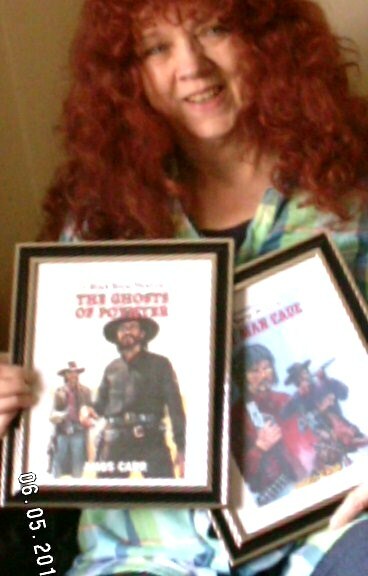 I sent it to Robert Hale, the only publisher of Westerns in the UK. I didn’t expect too much as they receive hundreds of manuscripts a week and only publish a few. One report has actually said, that I had two Western manuscripts hidden under my bed when Chris found his ancestors. That is definitely not true, I did have manuscripts under the bed, but Romances, not Westerns! Within a couple of weeks, my book was accepted, contract signed, advance paid, and I was well on the way to becoming a ‘real’ author at last. When I told my Mother, she asked me what kind of book I’d actually written and, when I told her, she was stunned. Her father, my Maternal Grandad Harold, had only ever read Westerns. There were never any other kind of books in the house! He had died long before I was old enough to notice what he was reading. Was it Grandad Harold who had given me that dream? I like to think so. Since then, my second book has been accepted, number 3 is with Hale now, and I am working on three others. And, I don’t care how strange you think I am, I really do believe that it is Grandad Harold who is guiding my pen, as he used to write a lot himself. 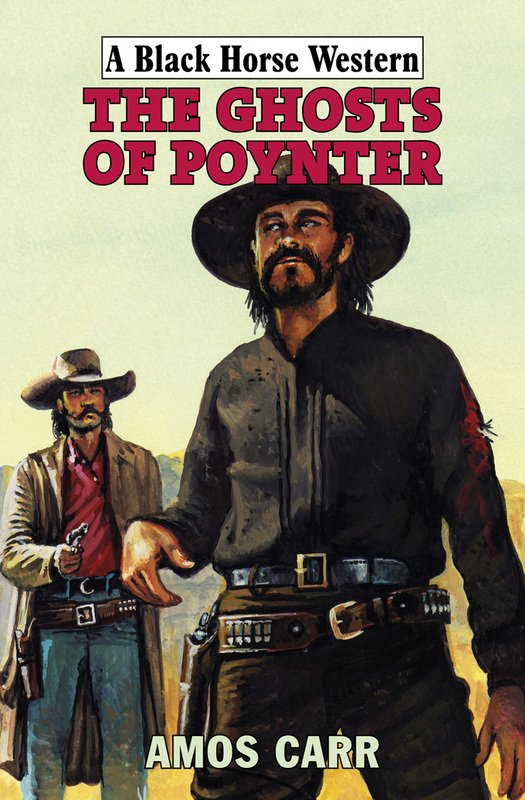 I write the Westerns straight into the computer, which I have never done with any of my other work but, once I get started on one, my brain goes so fast that my fingers just seem to fly. Now, after all these years, and all those horrible, depressing, rejections, I can say that I am a published author, with 2 hardback novels to my name so far. And it really does pay to write about what you know. Lesson learned, at long last. But I am still writing my Romances too. Just as a point of interest, there are only four women Western writers published by Hale, all in the UK, and all writing under male names! Our local paper came to do an article on me this week. I think the photographer had the contrast on his camera wrong — the hair is auburn, but in the paper it shows up as tangerine! Still, I suppose it stops the eye and makes people want to read about the mad tangerine headed witch! The latest article of mine, which is not about Westerns, will be appearing in a magazine called ‘Doll’s House and Miniature Scene’ in August. It’s about a Tudor, wood-framed, doll’s house, which Chris was building from the ground up, using real wooden joints, real stone flag floors, and so on. Then he had the stroke so, now he cannot complete it, we are hoping that someone will read the article, take the house, and love it to completion for us. I have set up my own website where I am placing anecdotes from my life, excerpts from my books, and other works. Please, do take a look, and leave me a message or feel free to contact me if there is anything you think I might be able to help you with. You can reach me on Facebook too, at JillMcD-C Author, or on Twitter, @JillMcD-C. If you would like me to come and talk to your group, or lead a workshop, and you are in my general area, please do contact me. Thank you for reading, folks! 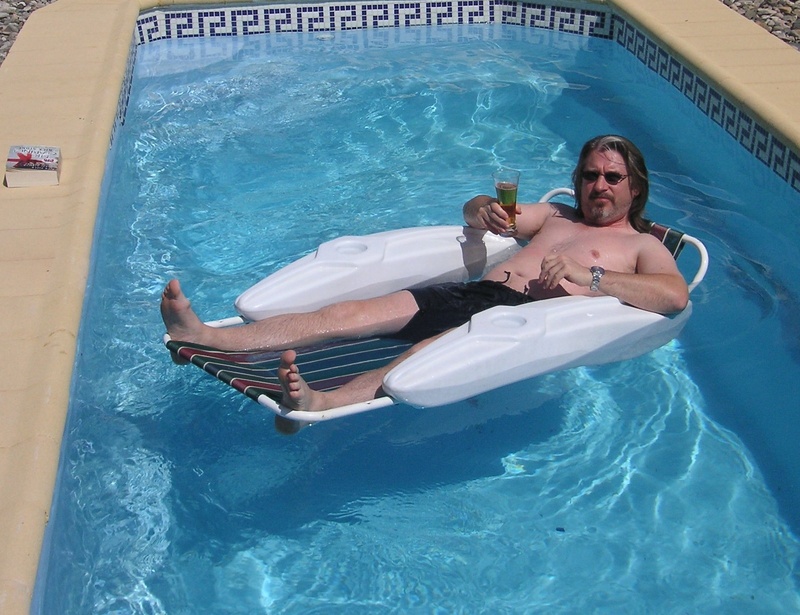 About six years ago my life was going swimmingly. I had the lot. I had the wife, the son, the house, the career, the car and even the trendy dog. Today? Well I haven’t got the house, the car, the job, the son, or the career. I’ve still got the dog mind, although sometimes, I wonder if he has me. Let me explain; I was a Policeman. I wasn’t an ordinary policeman, I was the type who did a bit of stand up comedy on the side. My life was filled basically with moments of fear, fighting, arguing and adrenaline, and that was just the comedy. In the police I was a response officer, I basically used to drive around Liverpool with blue lights flashing answering 999 calls. I’ve kicked in more doors than Jack Regan and turned over more bodies than Quincy. It was messy, bloody, dangerous and at times, desperate. And I loved it. I loved my colleagues, I loved the charging around shouting, I loved the challenge and I loved the thrills. I loved my life. I honestly used to pull up at my house of a night, in my quiet cul-de-sac, and sit for moment and think about how lucky I was. I know that sounds crazy when you say it out loud, but I did. I was that happy. Six years later, sitting here writing this, it seems like someone else’s life I’m writing about, I’m not sure of I’d recognise the bloke who used sit smugly in his car looking at his house with his gorgeous wife waving through the window. To be honest, if I met him, I’d probably think he was a bit of a kn*b. That bloke’s life finally fell apart when he found out his son wasn’t his. In fairness, although he’d not noticed it, his life had been in trouble for a while but, like a carrier bag that splits at the bottom and drops your spuds on the floor all at once, I/he just hadn’t noticed it going. I’ll not bore you with the details, that’s another story for another day but, six months after my carrier bag split, I found myself without a job (never write a resignation letter when you are crying) and sitting in a rented house I couldn’t afford with a designer dog that was, quite frankly, disappointed in me. I had to do something, so when a mate suggested getting a cab drivers licence to “tide you over till you get your head straight” I decided to do that, if only to get out of the house that had become a prison, and to start talking to people again. It was the best thing I’ve ever done. Because amongst the drunks, the drug addicts, the lager, the lovers, the lost and the lonely… I found myself. It happened at about four am, sitting in a park, eating a lonely service station sandwich and staring at a cat getting beat up by a bird, that I decided to write. And that cat, and that bird, led to my book Rear View Mirror being released about two weeks ago for the Amazon Kindle and if I ever meet them again I’ll shake them by the paw/claw. I’d never written anything before, so I was surprised at how good I felt when I wrote that first story. I didn’t just feel happy, I felt different, like something had happened in my head and my heart, like a place had been found and that I’d come home. I remember reading it a few times and smiling to myself. I even printed it off and stuck it by my bed to read when I woke up, just in case in the morning, after the shine had worn off, I found it was rubbish. I’ve still got that original story upstairs, and I still don’t think it’s rubbish. I created a blog, and posted the story up there, and told what remained of my friends on facebook. Some of them read it, a few of them commented, and I felt good for the first time in years, so I wrote another one, and another one, and another one. And I felt better; little by little, I felt better. A few months later a lady got in the cab and we chatted and she told me she edited a local magazine. I told her I wrote a blog about the cab and she promised to read it. I didn’t believe her. A few weeks later I got an email, and she said some nice things and offered me a column in the magazine and said she would pay me for the stories. I still didn’t believe her, but it turned out she was telling the truth. I’d become a writer, and I was happier than I’d been in years, and it wasn’t money, it wasn’t a house and it wasn’t a car that was making me happy… it was my heart. Tony Schumacher is a writer, author, broadcaster, and stand-up comedian. 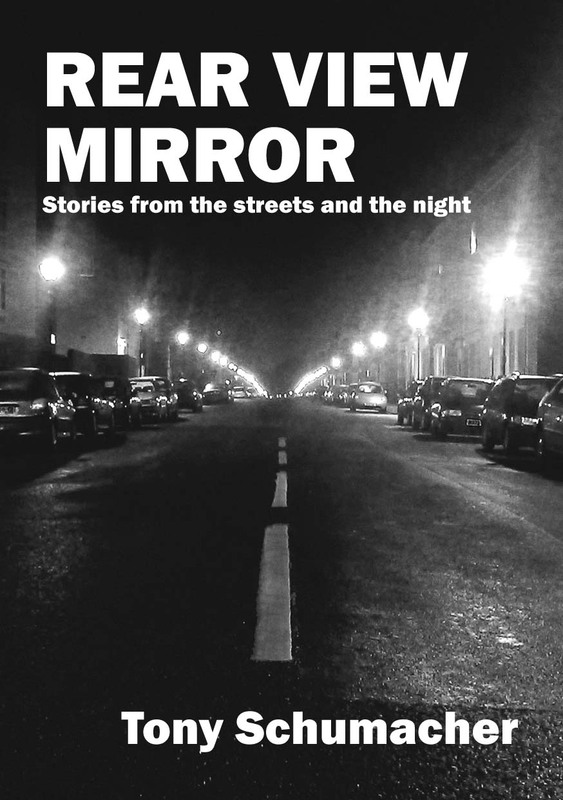 His regular column for the Liverpool and Manchester Confidential magazines “Rear View Mirror” has recently been compiled into a book and is available on Amazon. Tony has written for The Guardian newspaper and recently worked on their Reading the Riots project to investigate the causes of the 2011 disturbances in the UK. As a former Police officer, Tony can often be found wandering the lanes near his home, with his dog Boo, pretending to give out parking tickets and direct traffic. And at other times, he spends his time as a regular guest on Liverpool’s City Talk FM radio station, and has also presented several pieces on the BBC TV’s Politics Show. Read more on Tony’s website.